Why is going barefoot so socially unacceptable? The Sermon on the Mount is undoubtedly the most famous sermon in the world. Whether you know it well or have never even heard of it, there is basically warning after warning about self-righteousness, anger, foolishness, lust, desire for revenge, among other things, followed by an all round condemnation of our generally evil hearts. After properly denouncing and judging all of us, Jesus then in his unique way tells us “Don’t worry, Be Happy” (perhaps not so much that last bit, but at least an encouragement to be content in knowing that God knows all of our needs). “God so clothes the grass of the field, which today is alive and tomorrow is thrown into the oven, will he not much more clothe you, O you of little faith. Therefore do not be anxious saying ‘What shall we eat?’ or ‘What shall we drink?’ or What shall we wear?’ (Matthew Chapter 6 verses 30-31). “Clothes do make the man. Naked people have little or no influence on society”. But this is where I get to my main problem – what about footwear? Now I am not talking about a trip to the beach, or what you do in the privacy of your own home, but when was the last time you saw someone shoeless in public? If you were on a job interview panel, would you hire someone who turned up in a well dressed suit but no shoes or socks? 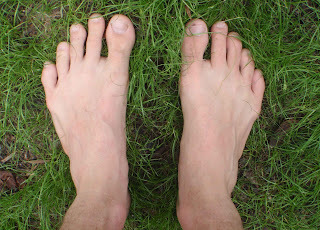 Would you be more or less likely to stop and help a barefoot traveller? When was the last time you saw a shoeless politician? While I align myself with Jesus, as both a fully shoed follower and a non-clothes worrier, I feel decidedly uncomfortable at the sight of anyone naked from the ankle down. Despite the warnings from the Sermon on the Mount about Judge not lest ye be judged, that is exactly what I do at the sight of any barefoot brethren. What about you? Are you footloose and fancy free in the footwear department, or can you explain why this unusual habit is still so socially unacceptable? I find nothing discomforting about it, although don't tend to do it myself. The next question is, if bare feet are an issue, what about thongs - pretty much the same thing with a layer of rubber under them. On another note, what is the difference between the word "shoed" and the word "shod"? And is "shod" related to the word "shoddy"?